There are often several factors that can influence the course of a reaction. Probably the most important is the structure of the alkyl halide, but the solvent can also play a role. The crucial difference between SN1 and SN2 reacions is the ionization step in the SN1 pathway. Factors that stabilize ions, and assist in ionization, promote this pathway. In general, more polar solvents are often helpful in nucleophilic substitutions; the nucleophile may be an ionic compound itself, and a more polar solvent will help it to dissolve. However, especially polar solvents may provide additional stability to ions. The most polar solvents tend to be those that are capable of hydrogen bonding, such as water and alcohols. These are sometimes called "polar, protic solvents". The "protic" part refers to hydrogen bonding; in hydrogen bonding, the hydrogen atom attached to a very electronegative oxygen or nitrogen develops a significant positive charge, like a proton. Polar, protic solvents can stabilize ions through very strong intermolecular attractions. The protic hydrogen can strongly interact with anions, whereas the lone pair on the oxygen atom can stabilize cations. These stabilizing interactions can strongly stabilize the intermediates in SN1 reactions. In the same way, the transition state leading into the intermediate is also significantly stabilized. The barrier for this reaction is lowered and the reaction can occur more quickly. In addition, polar, protic solvents may play an additional role in stabilizing the nucleophile. If the nucleophile is stabilized, it is less likely to react until a sufficiently strong electrophile becomes available. As a result, polar, protic solvents may also depress the rate of SN2 reactions. Once the alkyl halide ionizes and a more attractive electrophile becomes available, the nucleophile can spring into action. 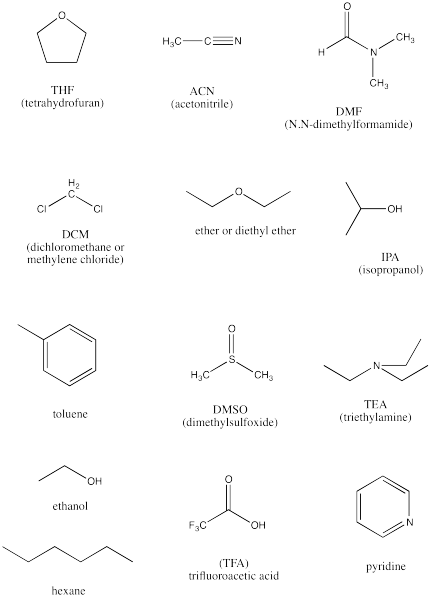 The following are a baker's dozen of potential solvents. a) Identify the protic solvents in this group. b) Identify the completely non-polar solvents in this group. c) Identify the polar, aprotic solvents. d) Rank the polar solvents from most polar to least polar. e) Identify two basic compounds, frequently used to facilitate proton transfers in reactions. Describe the SN1 reaction as slow, medium or fast in the following cases. a) NaCN and PhCH2Cl in acetonitrile, CH3CN. b) NaSH and 2-bromo-2-methylheptane in methanol. c) KI and 1-chloropentane in 2-propanol. Describe the SN2 reaction as slow, medium or fast in the following cases. a) LiCCCH3 and 2-bromopentane in THF. b) NaN3 and 3-chloro-3-methyloctane in DMF. c) LiOPh and 1-bromohexane in methanol.